Built around 1400 and standing until 1856, the bridge at Rochester was widely admired by 18th-century travellers. In her posthumous travelogue, "Through England on a Side Saddle' (1888), Celia Fiennes commented that "the Bridge at Rochester is the finest in England". 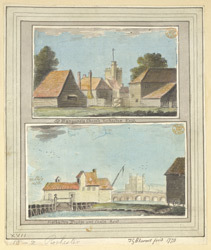 She noted that, unlike London Bridge, no houses were built on it, and that it had a number of arches "with the middle one which is to be opened by drawing up to give passage to barges and little vessells."